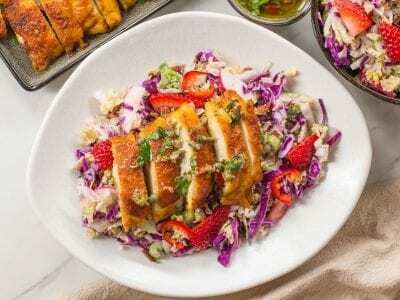 Keto spice crusted boneless chicken thigh recipe with salsa verde & low carb summer coleslaw recipe. Many people don’t realize that when you buy chicken thighs, you can ask the butcher (you know the person who stands behind the meat counter at the grocery store) to take the bone out for you, which leaves that luscious skin still on the chicken thighs for them to all crispy crisp when you cook them in a hot cast iron pan. Just make sure to save the bones from the butcher as it will make a yummy chicken stock down the road. One of my most popular keto chicken recipes with thighs is my Moroccan chicken stew with low carb golden cauliflower rice. You must check that one out! Start off your homemade coleslaw by thinking outside the box, or should I say the bag. If you buy those premade coleslaw bags at the grocery store, you are already losing! Those are overpriced, dry, and been sitting on the shelf for a long time. The key to making an easy and tasty coleslaw recipe is to buy two kinds of cabbage like red and napa, and finely slice it yourself. I have made coleslaw dressing recipes in the past that have a mayo base, but this time I made the dressing with tahini. It is nutty, earthy, and nice if you want to mix it up and try something new. 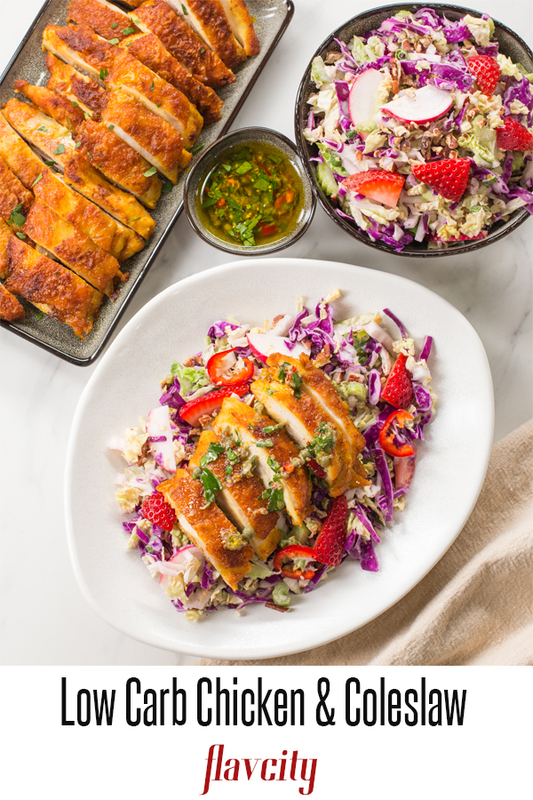 If you want to try my traditional coleslaw recipe with a mayo dressing, definitely check out this chicken meal prep with potato pancakes and red cabbage crunch slaw. So yummy. I made up this funky little salsa verde recipe to top the chicken with – and oh my is it yummy! It’s not a traditional salsa, you can’t dip chips into it, and it’s not a Mexican salsa. This salsa verde is American in style and based in extra virgin olive oil. It can be spooned over almost any protein, from hot chicken, to steak, to pork chops, to fish. 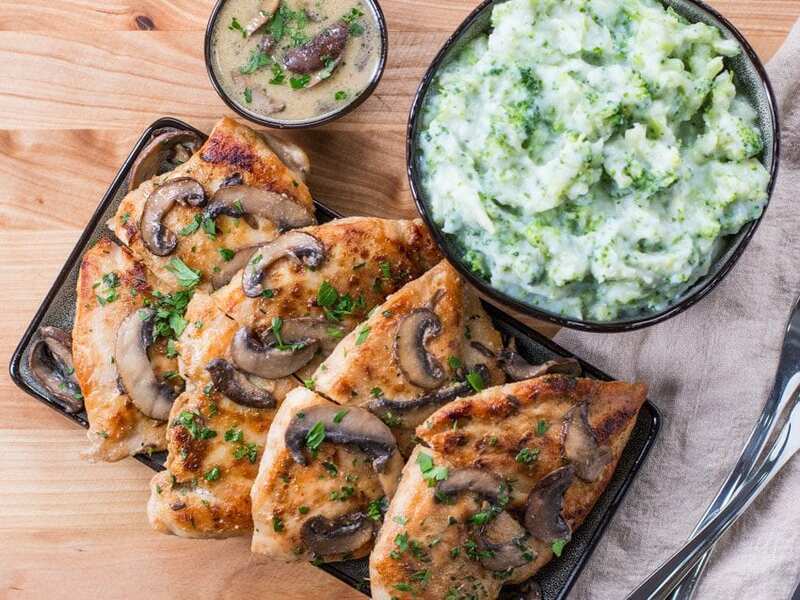 It’s so zesty, herby, and packed with flavor that the salsa verde recipe just makes the flavor of the cooked chicken sing! 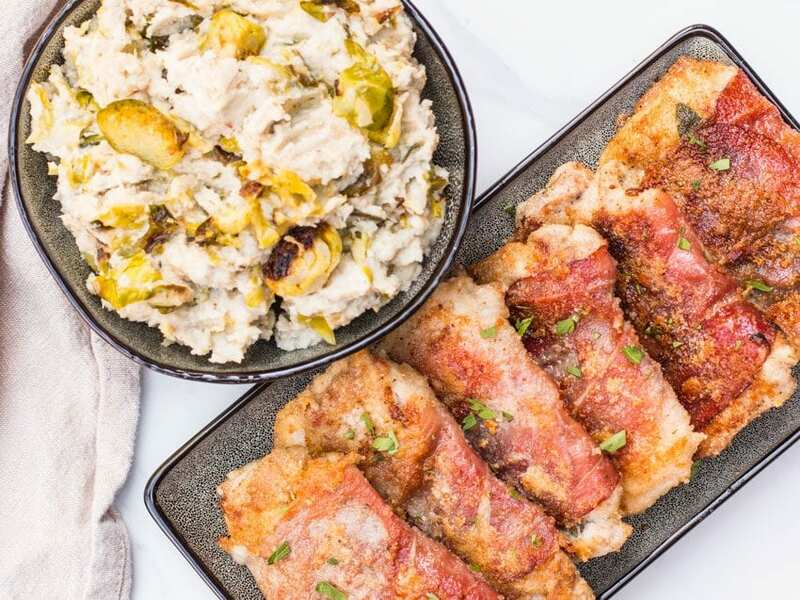 My website is full of some of the most tasty keto chicken recipes online, including full video tutorials from the FlavCity YouTube channel. Enough bland chicken recipes that are dry and overcooked. 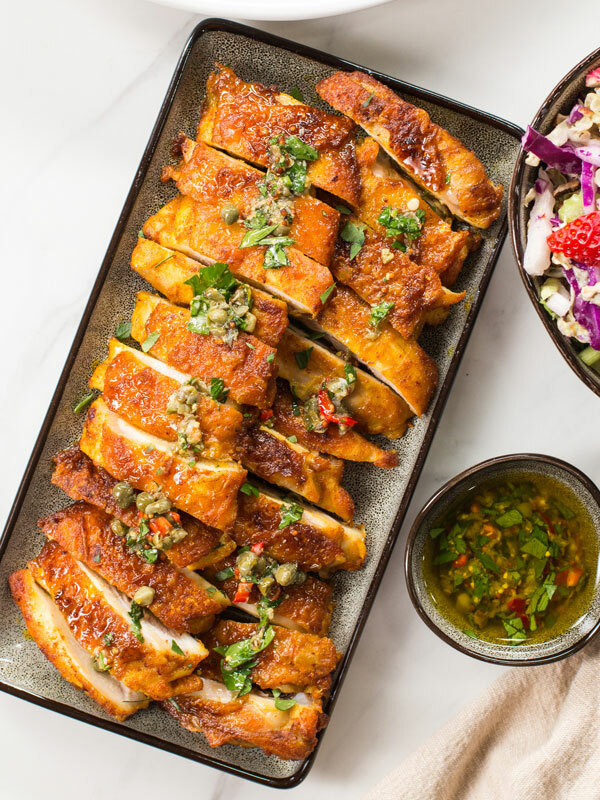 This keto chicken recipe using juicy thighs is perfectly cooked, spice crusted with smoked paprika and turmeric, and has the epic crispy skin that will make you swoon. 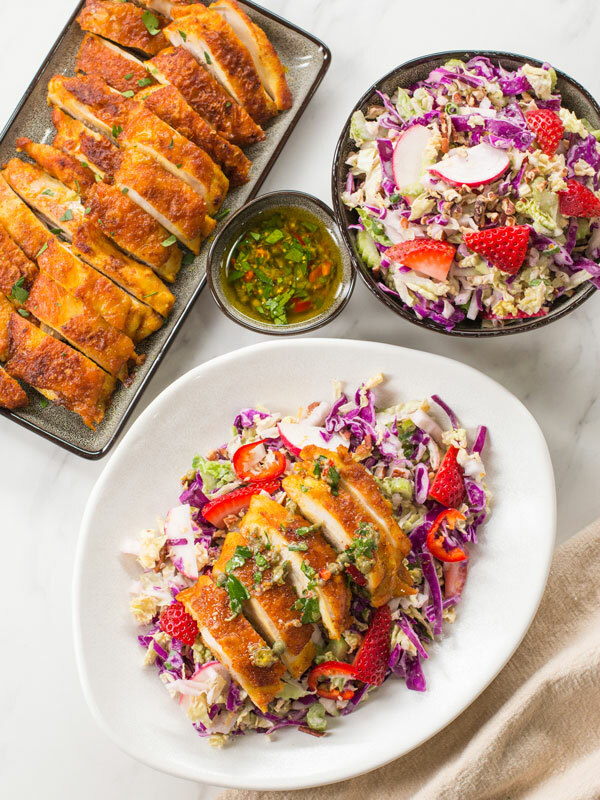 This quick & easy chicken keto recipe for boneless skinless chicken thighs is full of flavor and served with a summer coleslaw & salsa verde. Make the spice rub for the chicken by combining the smoked paprika and turmeric in a small bowl, mix well. Season both sides of the chicken with a generous pinch of salt and the spice rub along with a drizzle of oil and rub the spices all around. Pre-heat 2 large pans(or use one but you will have to cook in two batches) just above medium heat. Allow the pans to heat for two minutes, cast iron is best but non-stick will also work, then add 1 tablespoon of oil and allow that to heat for 30 seconds before putting the chicken in skin side down. Allow to cook undisturbed for 2 minutes and then raise the heat to medium-high and cook for an additional 6 minutes, or until the skin is well browned and crispy. Flip chicken over, reduce heat to medium, and allow to cook another 3 minutes, or until the chicken is cooked through. If you need to cut a piece in half to check if it’s cooked through, go ahead and do that. Remove chicken, cover very loosely with foil, and set aside. While the chicken is cooking making the salsa verde by combining all ingredients in a small bowl and mix well. Check for seasoning, you want the flavor to be a bit salty, lemony and spicy. Set aside. 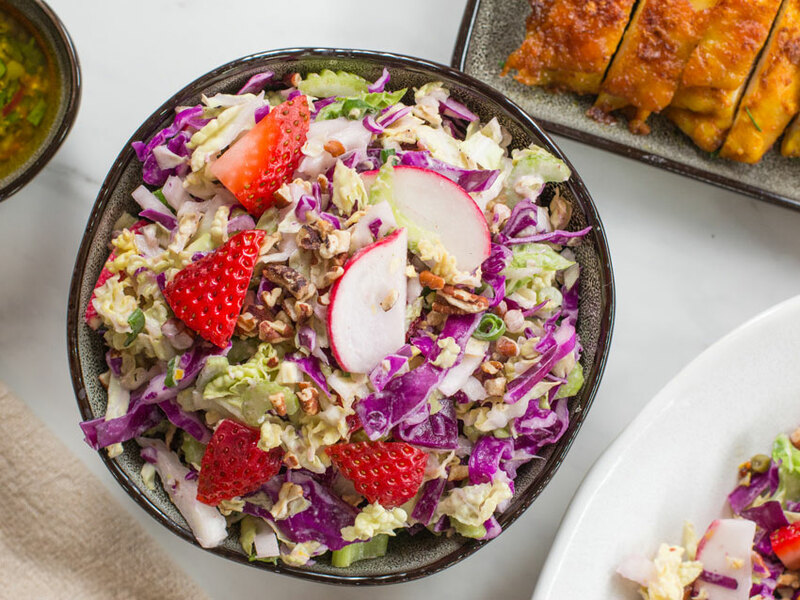 Make the slaw by thinly slicing both heads of cabbage and adding them to a large bowl along with the remaining ingredients up through the strawberries. Make the dressing by adding everything to a small bowl along with enough water to make the consistency pourable like salad dressing. Check for seasoning, you may need more lemon juice. Wait until right before you are ready to serve to dress the slaw and add ¼ teaspoon salt and a couple cracks of pepper to the slaw, those raw veggies need some flavor. Mix well and if you think it needs more dressing, make some more. Serve the chicken with some salsa verde on top and a side of slaw, enjoy! 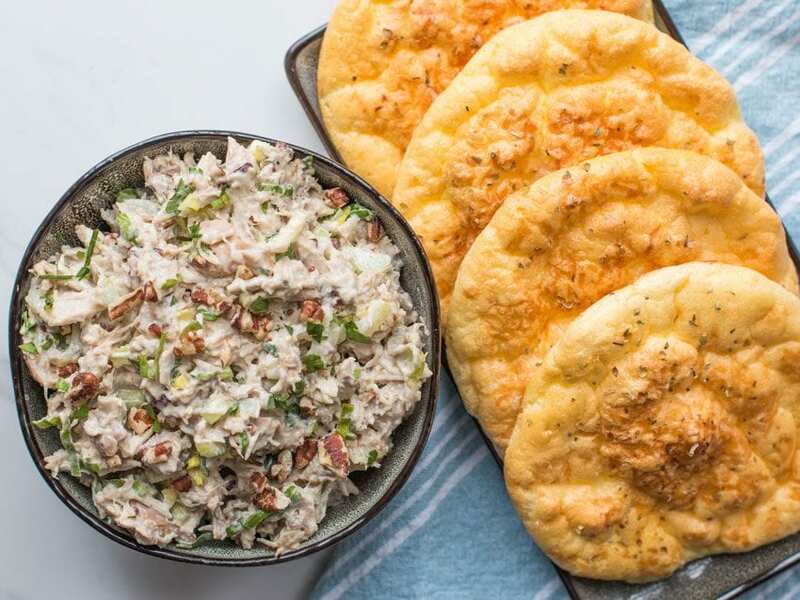 Everything will keep in the fridge for 5 days, but you have to keep the dressing separate from the slaw, and only dress it the morning of the day you want to enjoy it. You can freeze the chicken for 2-3 months, but can’t freeze the salsa verde or slaw. I am an olive oil fanatic, and I use really good extra virgin olive oil for this recipe . Use my promo code to get a bottle for only $1 from the oil club, no strings attached! This was amazing, but not even close to a 15 minute meal. More like an hour, but totally worth it. Ha, it really is a 15-20 minute dish…but I totally feel ya 😉 So happy you enjoy! If I divide the slaw in 5 Mason jars and put the dressing at the bottom of the jar, would that resolve the slaw/dressing issue? Just trying to save time in the morning. Just made this meal for dinner and its definitely a 5 star meal from any restaurant made right in my kitchen. Thank you for the recipe! Fantastic kristina, love to hear that! This was fantastic! My husband is on Keto and I am mostly vegan but I have salmon or shrimp here and there so tonight I made this dish and substituted shrimp for myself! Everything turned out great. I am always nervous about making chicken or meat because I can’t taste it but my husband absolutly loved the chicken! And that tahini dressing was soooo amazing! 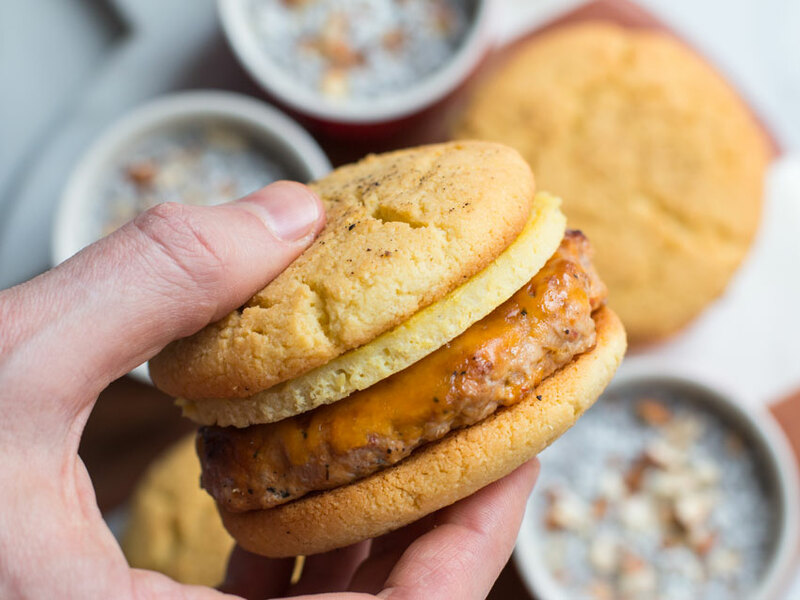 Thanks again for this amazingly easy yet flavorful recipe! Wow this meal was awesome, it had so many flavours to offer.. Thank you so much for sharing. Please keep the Keto meals coming, love it!! So happy to hear it! Thanks Bec!